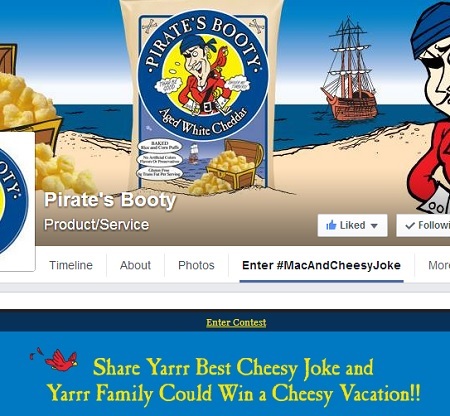 Enter the Pirate’s Booty Mac & Cheese Joke Contest and win family vacation for 4! Enter the Joke Contest before the closing date of July 14th, 2014 to be in with a shot! 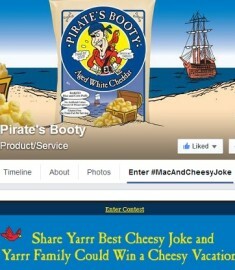 How to enter: send Pirate’s Booty your your best joke with the hashtag #macandcheesyjoke and @piratesbooty. Entries will be accepted through Facebook, Twitter, Instagram, and Vine. You can submit a text joke or a video joke too! Entries will be judged in the following way: Most votes = 20%, Creativity = 30%, Humor = 50% One lucky grand prize winner will win a family trip for 4 to the Wisconsin Dells. The trip includes airfare, 3 nights hotel, amusement park tickets for 4. There are also daily prize winner each getting a “cheesy” prize pack consisting of a Pirate’s Booty product and a branded whoopee cushion. ARV $30. ARV of Grand prize is $2,500. Enter the Pirate’s Booty Sweepstakes today and good luck! I love a good family vacation. The laughter, the good times and the memories to last a lifetime!